London: Thierry Henry has refused to rule out returning to Arsenal for a third spell at the club after playing in the final Premier League game of his two-month loan from New York Red Bulls. Henry is expected to play in the final game of his loan period in Arsenal's Champions League clash with AC Milan on Wednesday. But the Frenchman, who scored his 229th Gunners goal as he grabbed a late winner in a 2-1 win over Sunderland, would not say he had played his last domestic game for Arsene Wenger’s side. He told reporters: "Always I say, it’s kind of difficult for me to say no. If they need some help one day, I’ll be around. "It was so emotional. I knew when the final whistle blew that this was my last game in the Premier League, but I guess you can never say never. "I never thought I was going to come back and play for Arsenal. Who knows if I can say that this was definitely the end, it could be different. Who knows? When it comes to Arsenal I am always emotional." 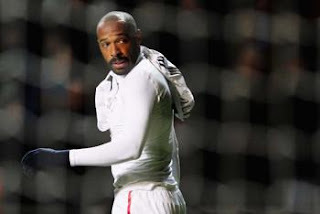 Henry received a warm reception from both sets of supporters at the Stadium of Light, however, he was just glad to get the win to cap what he believes has been a successful second spell at the club. He said: "It has always been a pleasure to come here to Sunderland. When I was warming up the fans near me started clapping. I have always found this a very special place to play football. "It was a fantastic atmosphere and overall it was so special for me. It really was magical. Looking at the results, everything seemed to go our way and now people need to keep on going and make sure we stay where we are."